I recently had the honor to write a story on the Swiss Alphorn School. I watched as beginners learned to blow their first note, advanced students played in harmony, and cows listened intently to it all. The alphorn is difficult to play. I tried and failed. All notes are breath controlled. The instrument is 3 meters long. 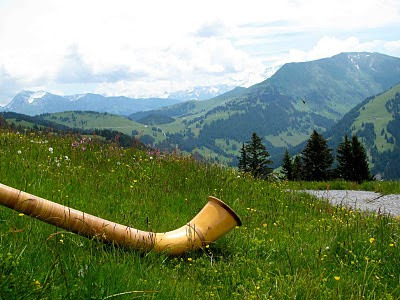 And if you haven’t previously played a horn instrument, it can be tough to make a sound. But when your practice room is a mountaintop and your audience is a cow, it’s definitely worth the effort to learn to play. Read more about how to learn to play this unique Swiss instrument by reading my feature article, Alphorn school blows students away on swissinfo.ch. What a really wonderful thing to (try to) learn! I loved the article on swissinfo.com. Thanks for reading! Yes, this is a whole other culture! Swiss mountain culture! It's great to see people from the cities embracing it too.